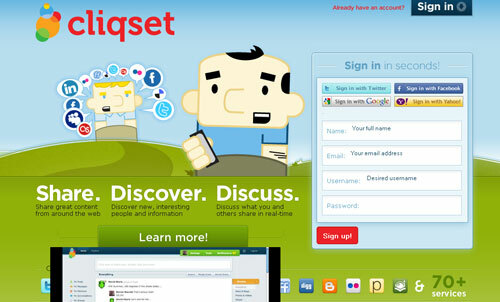 Cliqset (a social network) has introduced what’s being called the biggest social network integrating service, Cliqset 2.0. As social media becomes bigger and more involved in our online lives than ever, having multiple social media accounts is the most common practice among users. Keeping track of each, updating, replying and performing other tasks can be a hassle, not to mention a waste of time if you happen to be a social media addict and maintain multiple accounts. With apps like Tweetdeck and a number of others you can connect your Facebook, Twitter, LinkedIn and a couple of other profiles but Cliqset 2.0 aims to beat all existing integrating services. Cliqset can integrate with more than 70 different social services, including Facebook, Twitter, MySpace, Google, LinkedIn, Buzz, Foursquare and dozens of others in one interface. Twitter users can perform all functions exactly as they would on the site itself as Cliqset supports the Twitter API at all levels. The only function not supported is maintaining user lists. You can now search for users across the entire social web and start following them from Cliqset, even if they don’t have a Cliqset account. If that user does sign-up for Cliqset later on, Cliqset consolidates that connection and allows access to Cliqset-specific features. Cliqset also plans to bring an HTML5-optimized mobile site to devices like the iPhone, the iPad and Android. The improved Twitter integration also extends to signup. You can now sign up for Cliqset with your pre-existing Twitter, Facebook, Google or Yahoo account, eliminating one more barrier for membership.